While Mark is off chasing down leads to his former partner, Cindy and Jeremiah are once again in the middle of a crisis. A former co-worker has asked Cindy to clear his name of murder. Of course Cindy can't deny a request like that. The question is, is this Jeremiah's past catching up with him? Or do mysteries and trouble just tend to follow Cindy around constantly endangering her life? Add to the fact that people want someone in their circle dead, Cindy's parents and brother arrive for a visit. Cindy's mother and brother are horrible people! Cindy is a much better daughter than I ever could be with the way she holds her tongue when her mother is so deliberately insulting and hurtful. 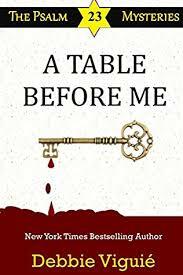 A Table Before Me is fast-paced and hard to put down! I enjoyed every moment of it and was caught up in the excitement and drama of every moment. As with all of Debbie Viguie's books in this series, this one too ends on a cliffhanger that has this reader desperate for the next installment...NOW! While I agree that cliffhangers are a bit fun and leave the reader wanting more, there is also a sense of unfairness in keeping us in suspense for the next installment that usually happens only once a year or longer. I'm a bit torn, if the books were just churned out one after another would they be as good, or would the creativity it takes to write cause the storyline to suffer? I want to see the ending of Jeremiah and Cindy's story, but I also want it done well, soooooooo, it looks like I will have to resign myself to being patient, it looks like we have several more books to go and several more years to get there!